Why has the turn of the twenty-first century been rocked by a new religious rebellion? 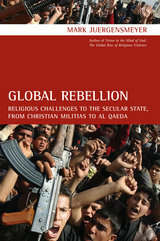 From al Qaeda to Christian militias to insurgents in Iraq, a strident new religious activism has seized the imaginations of political rebels around the world. Building on his groundbreaking book, The New Cold War? : Religious Nationalism Confronts the Secular State, Mark Juergensmeyer here provides an up-to-date road map through this complex new religious terrain. Basing his discussion on interviews with militant activists and case studies of rebellious movements, Juergensmeyer puts a human face on conflicts that have become increasingly abstract. He revises our notions of religious revolution and offers positive proposals for responding to religious activism in ways that will diminish the violence and lead to an accommodation between radical religion and the secular world. Mark Juergensmeyer is Professor of Sociology and Director of Global and International Studies at the University of California, Santa Barbara. He is the winner of the Grawemeyer Award for his book Terror in the Mind of God (UC Press). He is the editor of Global Religions: An Introduction and is also the author of The New Cold War? Religious Nationalism Confronts the Secular State and Gandhi's Way: A Handbook of Conflict Resolution, both from UC Press.